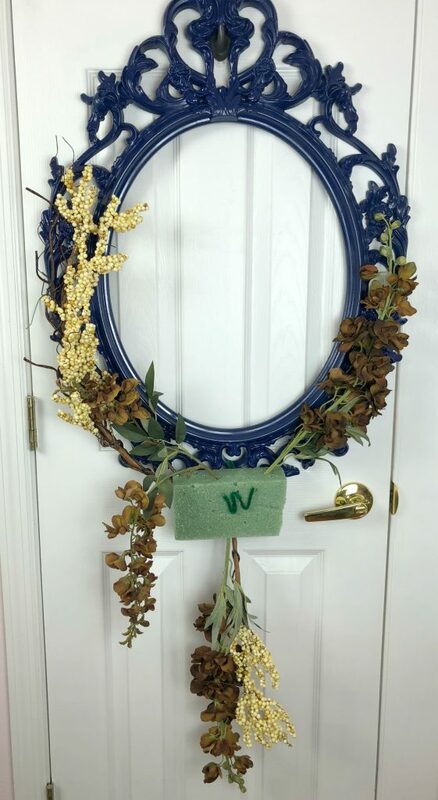 I love using these IKEA Ung Drill frames for so many home decor projects, but one of my favorites is using these frames as a base for a fantastic wreath. 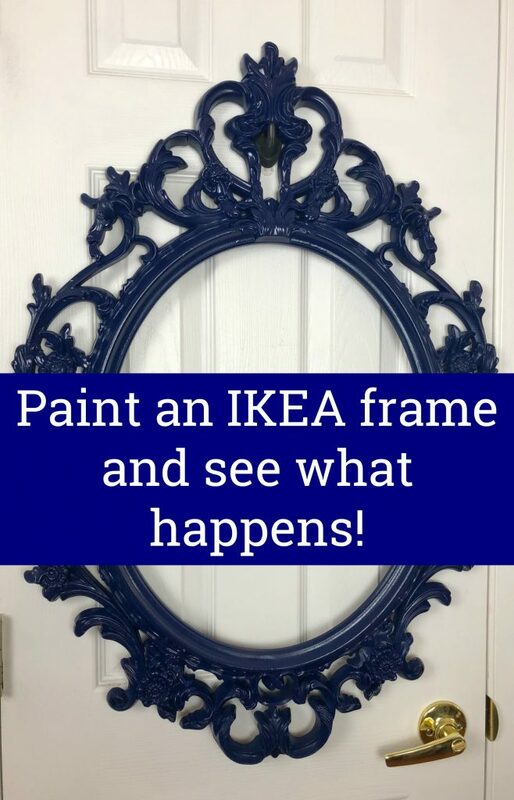 These frames are so easy to paint and repaint over and over again. I used Krylon Gloss True blue for this project. 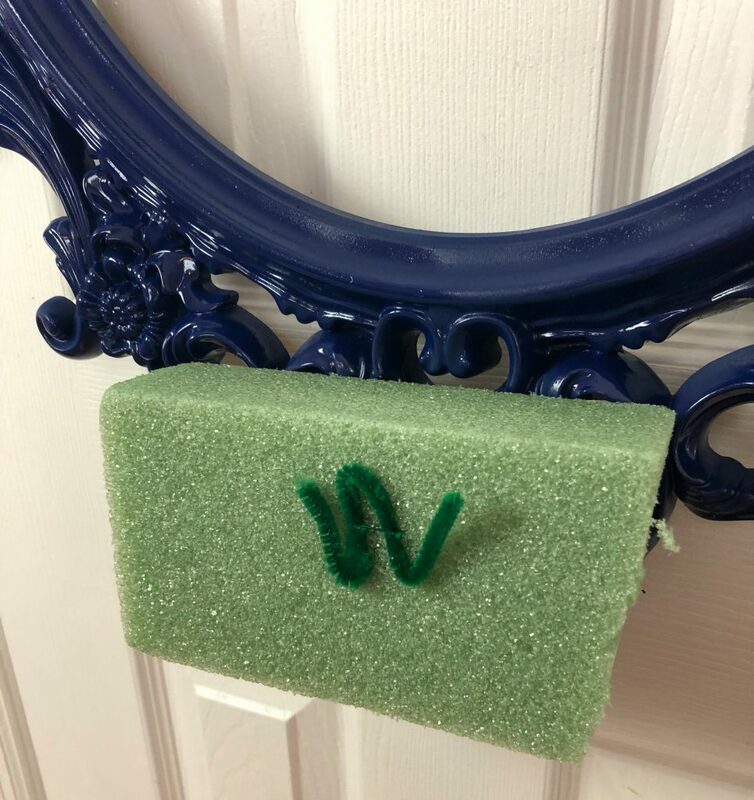 I use a piece of a pipe cleaner in an “m” shape, pull a a wire through the styrofoam using the “m” to keep the wire from being pulled all the way through styrofoam. I attached this piece of 5″ x 4″ styrofoam to the bottom of my frame with the wire I pulled though it. For more details on how to do this, you can reference my Fall Swag post. I began with long pieces of florals and berries, securing them in the styrofoam and then wiring the two lengths up the edges of the frame. Next I began adding my flowers into my floral foam. I used my steel pick machine to add a steel pick to each stem to make them more secure. When I have all of the florals added that I wanted, the final step will be to add greenery. Look what a difference just adding some greenery makes. Flowers don’t grow without leaves, and the addition of the leaves completes the arrangement on the frame. Have you seen what I am doing on Instagram lately? My patriotic decorations have been packed away for next year and my entry is now ready to greet guests for another month before I go full on Fall! This is beautiful Chloe! Where did you get the navy buffalo check rug? I love it! Hi Michelle! Thank you! I got the rug on sale at Target among the outdoor items. Love it. I have been quilting the past month but am itching to do a new fall wreath probably square! Welcome back! Oh wow, Jeanne, I admire anyone who can quilt! Thank you, I am ready to get back in the craft room a little more regularly! Great colors and awesome as usual! A really creative idea and wonderful end result. Love it! Great idea! I have some frames that could be used … thank you for the inspiration! Thanks Julia, it is a great change from the normal grapevine! Have fun creating! Not that you ever really left, but I am sure you understand my meaning. 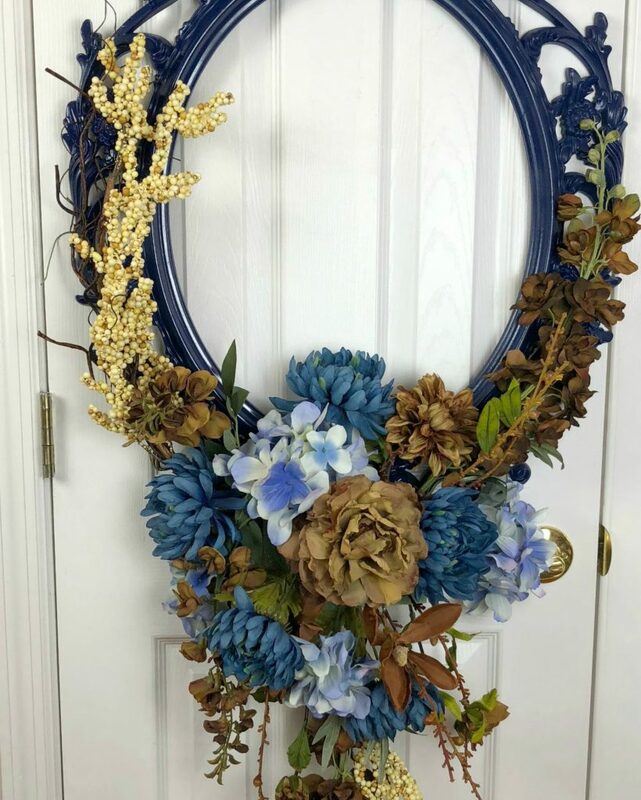 I LOVE this wreath. 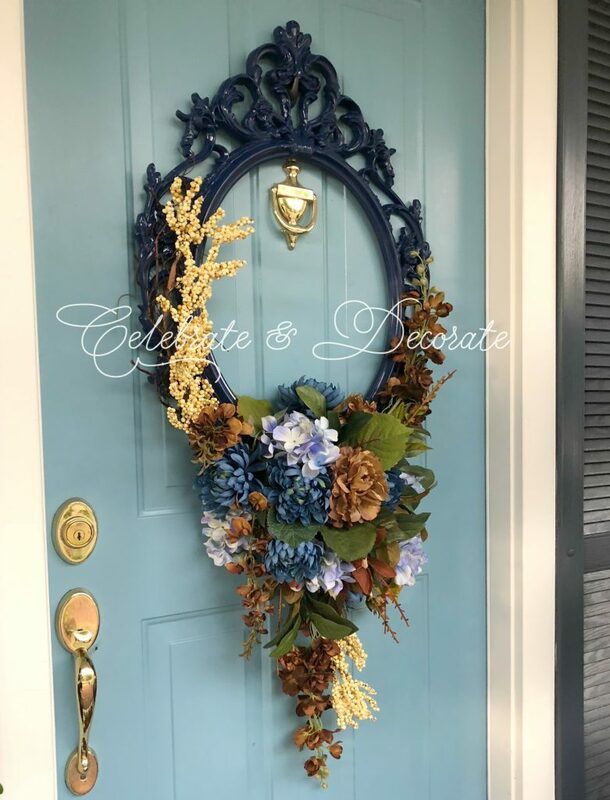 How inspiring you are to take something like a picture frame and make it work on your front door. I also enjoy your step by step instructions as I need someone to lead me by the hand. Thank you so much Kari! It is quite amazing how much time I spent on those girls and how much time I have now to spend on my own projects! Thank you so much Daisy! 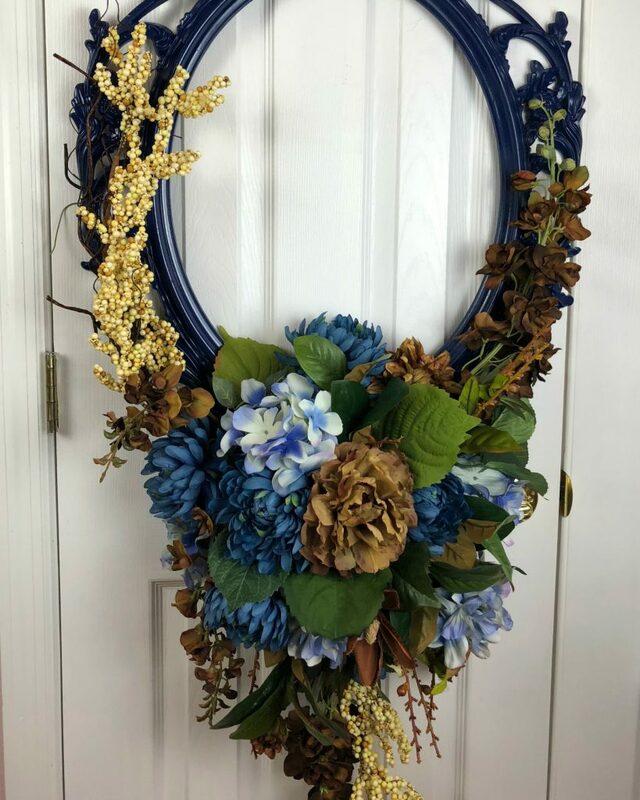 Chloe, I always love your picture frame wreaths! This one is absolutely beautiful! I need it for my front door. I hope you enjoy your day and have a wonderful weekend! Thank you so much Shannon! I think this is my favorite that I have done, with the blue paint! Beautiful! 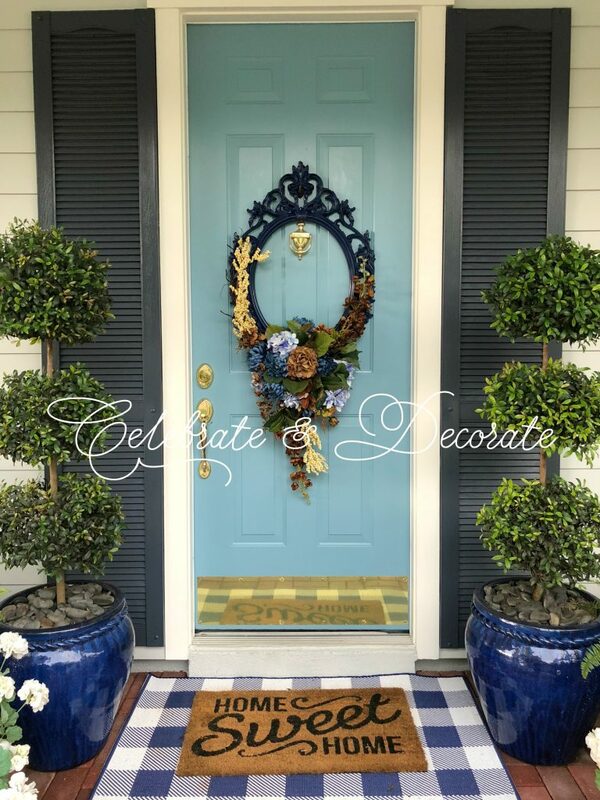 Perfect change from the usual front door wreath, and I love the placement instead of say, centering it over the knocker. Light bulbs going off everywhere here, LOL so much inspiration, thanks! Thank you so much Kelly! 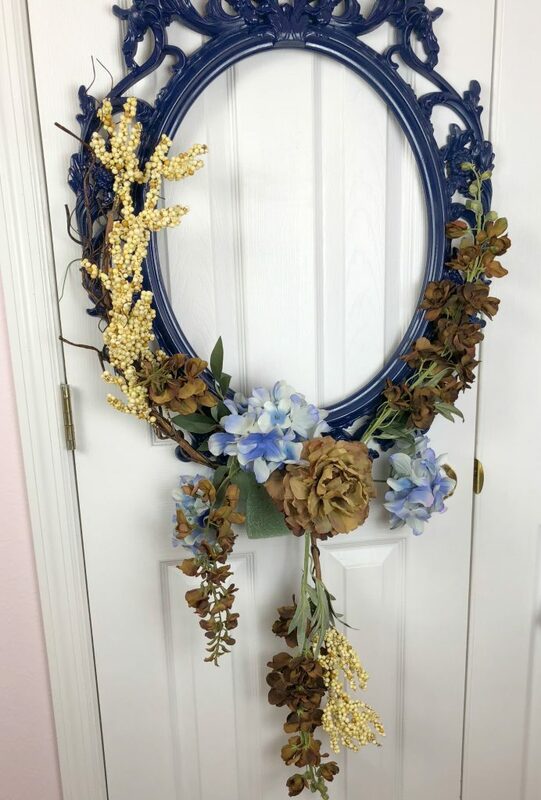 I love displaying something that is not the typical wreath! Beautiful. I check our Habitat for Humanity store frequently for frames U use for various projects with the great grandkids. A great place to find things like frames and furniture!